„Integrarea sitemelor de gestiune GIS in sisteme de arhivare a documentelor"
· Concert „Cvartetul Transilvan”. A fost înfiinţat în anul 1987. Nicuşor Silaghi, Marius Suăraşu, Vasile Jucan şi George Dudea. · Realizarea măsurătorilor cu GPS-uri şi descărcarea datelor în AutoCAD Civil 3D şi AutoCAD Map 3D. Just received in our daily mail from Prof. Harlan Onsrud, Executive Director of GSDI Association: ..your abstract submission has been accepted ...at the GSDI 10 conference in Trinidad in February 2008 (http://gsdi.org/gsdi10 ). Congratulations!" HUNAGI contribution will be presented by the SG of HUNAGI, Secretary of the GSDI Association. In line with the Conference topics, as selected theme the "Land Management and SDI: the Hungarian model" will be introduced. Ms.Piroska Zalaba, ICT Project Manager at DLAG MoARD, Prof.Béla Márkus (Faculty Geoinformatics, Univerity of West Hungary) and Director General Dr. Szabolcs Mihály will contribute as co-authors. The link http://clustrmaps.com/counter/maps.php?url=http://www.fao.org/geonetwork , demonstrates the impressive global uptake of GeoNetwork which will no doubt be further expanded by the recent release (21 September) of a much enhanced version 2.1 (see www.geonetwork-opensource.org) wrote Jelle U. Hielkema in his recent letter addressed to the Heads of the UN SDI National Coordination Offices. A recent article written by Jeroen Ticheler and Jelle U Hielkema in OSGeoJournal provides some further useful background. "Dear Gabor, I would like to send you the Instructions for Authors, and Call for papers for the International Journal of Digital Earth, and we would like to expect your contributions and your colleagues' contributions to the Journal." HUNAGI newsblog was read by 924 visitors from 82 countries in this month. Since January 2006 the page had 8602 hits. Next week we provide news on the availability of GEO documents, a meeting with the representatives of Calvadoss project, the GIS Conference and Program will be held in Cluj-Napoca and news related to the CEOS WGISS Meeting hosted by DLR in Germany. Presentations and Exhibition with TeleAtlas, Navteq and Nav N Go. 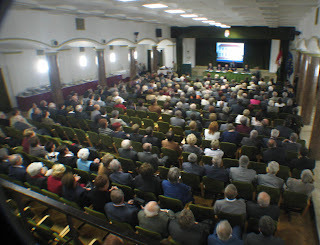 The Conference attracted full house in the Hunguest Hotel Griff in Budapest today. The press release will be available in electronic form asap. 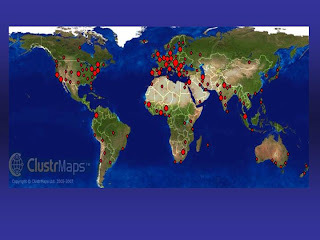 Notice: in September 2007 only, this blog was visited from 70 countries! 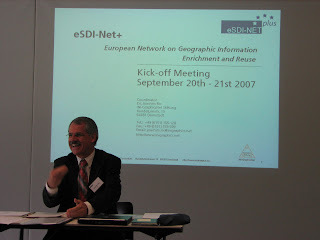 This leaflet will be distributed at the Meeting of Heads of the County Land Offices held in Siófok today and in Darmstadt at the Kick-off Meeting of the eContentplus project called eSDI-Net+ hosted by the Fraunhofer Institute on 20-21 September 2007. The readers of this blog during the past several hours were identified among others: Intergraph Corp,. Free University of Brussels, Navigation Technologies, Swiss Federal Government, Yale University etc. - the invitation of HUNAGI to give a message at the Meeting of the Heads of County Land Offices on 19 September 2007. Humboldt Project Coordinators meeting completed.today. The PCC elected Peter Winkler of FÖMI, Hungary unanimously for member of the Reviewers' Board. 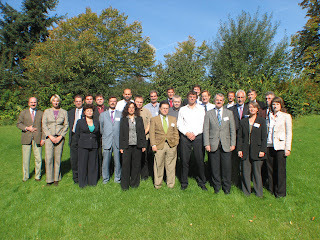 The meetings participated by 65 experts from the 27 consortium partners also were well attended from Hungary. 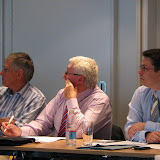 FOMI was represented by four experts: Peter Winkler, Gyula Iván, Dávid Kristóf and subcontractor László Bérces, who all are active in the elaboration of the Working Packages. 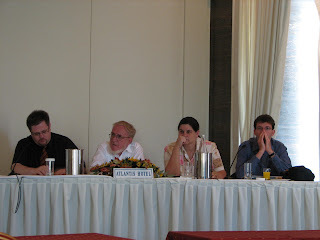 HUNAGI was also represented by Gabor Remetey-Fülöpp, member of the Advisory and Reviewers' Board. Some basic information will be provided asap. 1. UN-SPIDER webpage has been updated with information on upcomingOutreach Activities. Check out:http://www.unoosa.org/oosa/en/unspider/workshops.html. 2. International Workshop on “Climate Change and Adaptation in Africa –the Role of Space Technologies” to be held in Algiers, Algeria from 22 to24 October 2007. 3. Sentinel Asia Flood Working Group has just released new web pagesshowing precipitation information. You can see daily 24 hours accumulatedprecipitation by satellite data and heavy rain information derived fromstatistics. 4. The International Charter Space and Major Disasters was activated arecord 8 times in August to provide support to emergency responseactivities in the area of floods, fires, earthquake and hurricane. Duringthe same period Sentinel Asia was activated for the floods in Bangladesh,demonstrating the complementarity of both initiatives. 6. "The Use of Regionally Owned Space infrastructure for DisasterManagement in West and North Africa – Status Quo and Prospects" – UNOOSAthrough UN-SPIDER is supporting this event which will be held in Abuja,Nigeria, on 15 – 16 October 2007. 7. EUMETSAT’s Product Navigator – Environmental Satellite Data, Productsand Software. Check out: http://www.eumetsat.int/products/index.html. 8. TerraSAR-X used in Charter activation for floods in the UK on 24 July2007. Products available onhttp://www.disasterscharter.org/disasters/CALLID_166_e.html. 9. SERVIR - A 21st Century System for Improved Environmental DecisionMaking in Mesoamerica – Check out: http://servir.nsstc.nasa.gov/index.html. 10. International Academy of Astronautics (IAA) – 2007 African RegionalConference, Abuja, Nigeria, 3 – 5 December 2007. With the following theme:Space for Africa: Path to Knowledge and Development. Deadline for Call forPapers: 15 October 2007. Regards DavidDavid Stevens Programme Coordinator UN-SPIDER United Nations Office for Outer Space Affairs Vienna - Austria Tel. ++43-(1)-26060-5631 - Skype: tazarkountFAX ++43-(1)-260607-5631 - E-Mail david.stevens@unvienna.org"
From our daily mail: Prof Harlan Onsrud wrote a reminder on the GSDI 10 Abstract deadline and the availability of the newest GSDI Newsletter downloadable from the website of the GSDI Association. According to the website's news, "Poland’s Geoportal is set to digitise and centralise all land-related data and information in Poland.... The portal will be fully operational in 2009." In case you need any other information, please be so kind and address the Conference Secretariat. This notification is not applicable if your Registration From has already been sent. Thank you for all your professional efforts with respect to taking and posting in an organised way the photographs from the ePSIplus Copenhagen meeting. On the behalf of the ePSIplus Thematic Network and all the experts that were in attendance at the Copenhagen meeting we would like to formally THANK YOU Gabor – an excellent contribution and I hope also one tht brings back happy memories for all. Please also note that EADP have completed the PowerPoint template which I have also posted to the Copenhagen event page. Invited by Editor-in-chief Dr. Szilárd Szabó a special meeting was hosted by VÁTI today in order to listen a summary given by Dr. Balázs Rátai of Carneades Consulting on "virtual reality" which will be one of the main topic of the Journal's next issue. The first impressions and feedbacks on the electronic version called terinformatika-online (http://www.terinformatika-online.hu/ ) was also discussed by representatives of HUNGIS and HUNAGI as well as companies Térképtár and CData. Referring on the operating Térinformatika - HUNAGI cooperation, recommendation was made to use the Journal's capabilities e.g. to disseminate information and generate feedback from the users on the legislative framework developments in the EU, which will be binding for all players both in domestic and European dimension. Representative of the Hungarian GI Association mentioned, HUNAGI might be potential partner in seeking the opportunities to launch a Hungarian GIS/GI Yearbook (for 2008). Organised by the Agency for Land Relations and Cadastre Republic of Moldova an International Conference in the subject “European experience in cadastre and spatial data development” will be held in Chisinau, on the 14-17 of October 2007. Principals. These versions will be the official documents for GEO IV." Ihlet will support HUNAGI's presence in EUROGI while HUNAGI will facilitate the cross-border networking of existing NGIAs and establishment of new ones. Participants were invited by Dr. Rezső Berencei, Managing Director of the HUNGIS Foundation. Hosted by Gyula Biró, Director General of Geodézia Zrt, the meeting was moderated by Richard Szabó, Managing Director of GEOlevel. All the participants agreed with the importance of the project initiative, to set up a pilot metadata service for a selected area in Hungary. More than 15 Stakeholders (including HUNAGI) were invited and participated as collaborative partners and supporters of the proposed project. HUNAGI as SDIC registered by the European Commission invited three of the core partners Blominfo, GEOlevel and CData-Térképtár to became member of the Hungarian GI Association to give a stronger voice of the project and its consortium in the review procedure of INSPIRE's implementing rules. Mr. Edric Keighan, President and CEO, CubeWerx Inc.
Mr. Darko Poletto, President, Spatial Knowledge Engineering Inc. Interested parties should contact HUNAGI till 6th Spetember as latest. 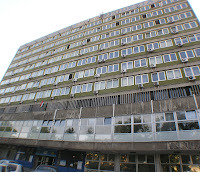 HUNAGI has the opportunity to submit the coordinates to the Canadian Embassy in Budapest to apply for attendance. "...As agreed at the meeting there is much to do to resolve the issues that are impeding maximising the re-use of PSI across Europe that Associations together with ePSIplus Thematic Network need to complete. to provide some initial feedback to those of you who kindly presented then please see the attached PDF file containing the presentation timing distribution curve. Please keep an eye on the Copenhagen meeting event page as further material will be added related to the meeting itself...."
N.B. 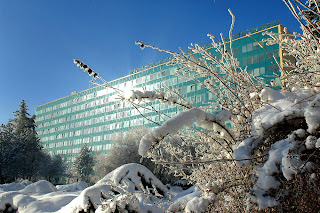 This newsblog was visited during the past several hours by the University Pierre & Marie Curie, CNES, University of Ljubljana, the European Commission (several hits), the Technical Research Centre of Finland. During the first three days in September this blog was read by visitors from 19 countries.